“I was feeling very well from the very beginning of the tournament. I knew that I could have reached an important result, but today I exceeded my expectation with a perfect match against a strong opponent.”Less than one month ago, the Italian city of Genoa endured a horrific tragedy. The iconic Ponte Morandi bridge partially collapsed following a torrential rainstorm. As vehicles fell into the Polcevera River, 43 people lost their lives. While sports may seem inconsequential in the face of such devastation, they can serve as an important outlet for those to combat grief. Three weeks later, as the city continues to mourn and rebuild, the 15th edition of the AON Open Challenger provided a moment of inspiration. More than 2,000 fans packed the Center Court at the Valletta Cambiaso. And it wasn’t just for the final. Every day of the week, the stadium was filled to capacity for the evening matches. People flocked to the tennis centre after a long day’s work to catch a glimpse of world-class ATP Challenger Tour action on display. On Sunday, it all culminated with home hope Lorenzo Sonego’s triumph. The Turin native, born just two hours north of Genoa, defeated 2013 champion Dustin Brown 6-2, 6-1 for the title. It was his second Challenger crown, having also prevailed at home in Ortisei last year. “It has been really incredible,” Sonego told ATPWorldTour.com following the final. “The public here are very warm and I really thank them for the support during the week. It is a great emotion to be surrounded by such a supportive public. The tournament is very well organized and the location incredibly beautiful. 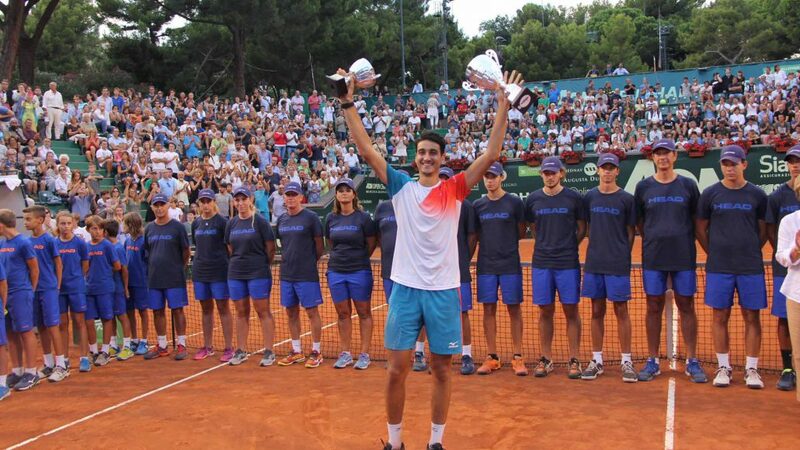 Not only did Sonego claim the title at the prestigious €127,000 event, but the 23-year-old also broke into the Top 100 of the ATP Rankings with his victory. One of two Italians to crack the Top 100 this year (also Berrettini), he ascends to a career-high No. 90 on Monday. The breakthrough comes less than two weeks after Sonego won his US Open debut. Entering the main draw as a lucky loser, he would defeat Gilles Muller for the first five-set win of his young career. It is not the first time the AON Open Challenger has provided tennis as a source of comfort in the face of tragedy. In 2016, the tournament donated all proceeds to victims of a 6.2 magnitude earthquake that struck central Italy.